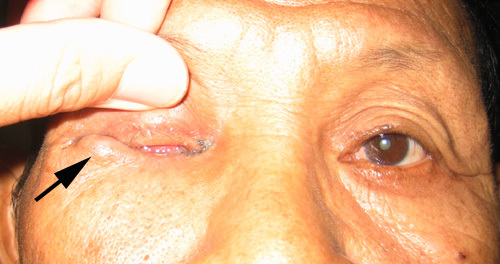 A 72 year-old man from a remote village complained of poor vision in his left eye (Figure 1). The cause for the poor vision was a dense left cataract. 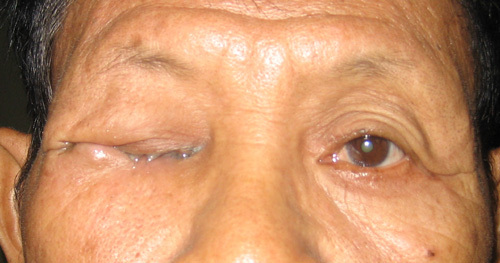 He also had a right complete ptosis of 5-year duration which did not appear to bother him. Attempt to open the right eye was difficult as the lid was firm and rubbery (Figure 2). The globe was visible through the slit but immobile ie. a 'frozen' globe. A lesion was noted on the lateral aspect of the lower lid and the CT scan revealed an infiltrative lesion involving the inferior orbit. There is no bony lesion or cerebral infiltration (Figrue 3). Biopsy of the skin and the orbit through a subciliary incision revealed palisading of neoplastic cells consistent with basal cell carcinma. Figure 1. Right complete ptosis and a left dense cataract. Figure 2. Attempt to lift the right lid was difficult. Arrow shows a nodular skin lesion. Figure 3. Coronal CT scan shows an infiltrative lesion in the inferior orbit. a. What are the risk factors for orbital invasion by basal cell carcinoma? b. What are the treatment options and what is the best option in this patient?